Apple's custom T2 chip recently made its way from the iMac Pro to the 2018 MacBook Pro, where it is responsible for a lot more than people think. AppleInsider explains everything you need to know about it. Editor's note: This piece first ran shortly after the MacBook Pro added the T2 chip. However, given its inclusion in the new MacBook Air and Mac mini, a refresher is in order. The article also includes new information from Apple regarding the T2's capabilities. First off, the T2 is an upgrade from the T1 that launched inside the 2016 MacBook Pro. The T1 chip's main purpose was running the System Management Controller (SMC), and the Touch ID sensor within the Touch Bar. A Secure Enclave co-processor handles encryption of fingerprints, and plays a gatekeeper to microphone and FaceTime HD camera access. The newer T2 takes care of the exact same tasks as the T1, but adds an image signal processor, audio controller, and a mass storage controller that includes a dedicated AES engine for encryption. Apple says the image signal processor works with the FaceTime HD camera to enable enhanced tone mapping, improved exposure control, and face-based auto-exposure, as well as automatic white balancing. As you can see in our video, white balancing is indeed much better, exposure is improved, and the detail in hair and eyes no longer gets crushed by dark shadows. We've also noticed a pretty big difference in microphone quality, thanks to the T2's audio controller, which processes signals that ultimately end up at the MacBook's stereo speakers. That probably contributes to the better sound output found in this year's MacBook Pro models. On top of that, the T2 chip adds "Hey Siri" support. Thanks to the new SSD controller, the T2 automatically encrypts your drive regardless of whether you have FileVault on or not. Apple recommends that you do enable it, however, for added security. Without FileVault, your encrypted SSDs will automatically mount and decrypt without a password when connected to your Mac. 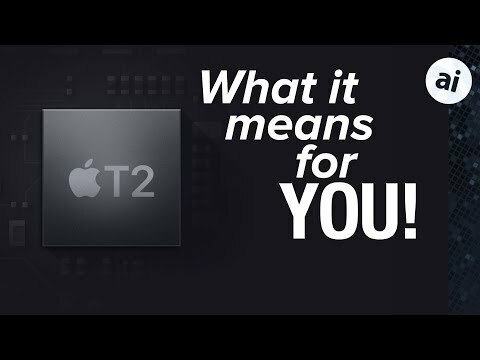 The T2's encryption uses dedicated Apple-designed silicon instead of a third-party processor. There are two benefits to this, the first being the fact that your data never reaches the Intel processor, so it's more secure. The second is that by using dedicated hardware, there's no effect on SSD performance. After enabling FileVault on the 2017 MacBook Pro, which lacks the T2, we were told we would have to wait a full day for encryption to finish -- and that if we suddenly decided against it, we wouldn't be able disable it until the process was complete. Even once it finished, storage read speeds dipped significantly. On the 2018 MacBook Pro enabling FileVault is instantaneous, with no change in subsequent speeds at all. The biggest security enhancement may actually be Secure Boot. This makes sure that only a legitimate, trusted operating system loads at startup. By default it's in Full Security mode, allowing only your current OS or signed OS software trusted by Apple to run. It also disallows booting from external media, such as USB or Thunderbolt drives. This offers huge protection from hackers who could potentially boot into a different operating system in order to steal your data. Although not recommended, you can change these settings within macOS Recovery mode. Since Apple's custom T-series chips are integrating an increasing number of system controllers, it may be making it easier than ever for Apple to switch over to their own line of processors and ditch Intel for good. And seeing as Intel has once again delayed delivery of their 10-nanometer processors, an architecture Apple has been on for over a year with its A-series processors on iPhones, a switch doesn't seem like a bad idea. In the long run, Apple's chips could mean the end of the "Hackintosh," which is basically a Windows PC packed with macOS-compatible hardware that is able to run macOS after some user hacks. The System Management Controller in the T2 is able to identify when it's running on non-Apple hardware, and if Apple requires a T2 validation in macOS after it spreads across the entire line, it could release an OS that simply won't run without the technology. To coincide with 2018's MacBook Air and Mac mini refreshes, Apple published a T2 Security Chip Overview (PDF link) detailing the Mac-specific hardware feature. While much of the white paper is a retread of information made available through Apple's own marketing materials, there are a few nuggets that offer insight into lesser known capabilities. For example, the T2 chip physically disables the microphone when a laptop lid is closed, effectively defeating potential remote surveillance hacks. "All Mac portables with the Apple T2 Security Chip feature a hardware disconnect that ensures that the microphone is disabled whenever the lid is closed. This disconnect is implemented in hardware alone, and therefore prevents any software, even with root or kernel privileges in macOS, and even the software on the T2 chip, from engaging the microphone when the lid is closed," Apple says. Onboard cameras are left untouched, however, as Apple notes a closed lid also completely obscures that component's field of view. Apple authorized reseller Adorama is knocking up to $150 off every 2018 13" Touch Bar and up to $350 off every 2018 15-inch MacBook Pro with instant rebates and promo code APINSIDER when used with this shopping link or the pricing links in our Mac Price Guide. Adorama also will not collect sales tax on orders shipped outside NY and NJ, and each system ships for free within the contiguous U.S. With the exclusive discount, many shoppers outside those two states can save up to $635 compared to buying from Apple, a significant cost savings for the brand-new models. Those looking to finance the purchase can also take advantage of no interest financing when paid in full within 12 months using the Adorama Credit Card. For help redeeming the coupon code, please see the step-by-step instructions found in this guide. I agree that the T1 and T2 are the start of a move to integrate and consolidate third party silicon into Apple's own silicon, that may ultimately result in Apple being able to replace the GPU and CPU fairly transparently in the future. But Apple will only do that which is worthwhile for their needs. So the end to this article repeats the rumor about Apple moving to their own chips. There is still a major problem with this idea, which is that even with whatever improvements the A12 and A12X will bring, they won’t be nearly powerful enough for that. Of course Apple could be working on a design that will get around that problem, but until we see some evidence of that, this is still nothing more than rumors, and the likelihood it will happen is no closer today than it was when the rumors first started. Any chance there's a block diagram of the chip to look at? So the end to this article repeats the rumor about Apple moving to their own chips. There is still a major problem with this idea, which is that even with whatever improvements the A12 and A12X will bring, they won’t be nearly powerful enough for that. I don't understand what you're getting at. Are you assuming that people expect Apple to use an A12/X in a laptop or desktop, or are you assuming that the A12/X is more powerful chip Apple could possibly design? Surely you understand that the A-series chips are designed around the very limited volumes of the devices in which they go into. Apple's A series chips are made for slim mobile devices - phones and tablets. I don't see any major issue with the CPU performance versus an ultra-low-power Intel processor, were it to be used in a slim small laptop, but that's not what Apple will do IMO. A pro laptop or desktop grade Apple chip, if they were to create one, would likely be given a new naming scheme. "X1" or "F1" or similar. It'll be an amalgam of the latest A chip (CPU, GPU, I/O, Memory Controller), the latest T chip (security, SSD, additional internal I/O - most of this is already in the A chip TBH), additional PCIe support (x16), and an uncore suitable for desktop bandwidths and loads. You don’t understand? It’s pretty simple. The first Mac assumed to use an Apple chip is the Macbook. That has about the same power envelope in the iPad Pro 12.9”. But the Macbook has somewhat better cooling capacity. we’ve discussed this numerous times. Is it a Mac if it can’t run native Mac software? No, it isn’t. It like Microsoft’s work. They have “Windows” running on an ARM chip, but the software needs to be recompiled and fixed before it can run. It’s not really Windows. so Apple maybe has macOS running natively, and a few of its apps. But what about everything else? It took well over a year to get Office, Photoshop and other major apps working, including Apple’s own, when they went to x86. Again when they went to 64 bits. emulation on the same chip family from a different OS isn’t a performance problem, but when coming from a different chip family, it is. It’s as though people totally forgot all the problems in emulating Windows software on a ppc machine, with it running dog slow, at about 20% of the speed. That was using powerful ppc CPUs. this isn’t a simple thing. I read every year, when a new A series comes out that we can expect Apple to move soon. But it hasn’t happened because it’s not practical yet. It's TSMC 7nm that'll be similar to Intel 10nm, and it should ship in volume first. It's not true however to say Apple has already shipped what Intel is going for in 10nm for a year - TSMC and everyone else just names their fabs one ahead of Intel does. But they should converge by 10nm/7nm respectively. A11 is already powerful enough to run a laptop and frankly would be a better Mini that the current Mini. This doesn't even consider easy upgrades Apple could do to make a better laptop/desktop chip. One example of easy would be wider paths to RAM. More cache and a beefed up GPU are other easy avenues to improved performance in higher power devices. As for evidence that Apple is doing this well obviously that would be a secret. However we have to ask why has all significant Mac development stopped? A 5 year old Mini is a joke right now and the entire rest of the lineup is pretty pathetic too. Even the recent laptop updates leave a lot to be desired. So either Apple doesn't care about the Mac or they are up to something. That could be custom ARM chips or they could be doing a specialized or custom i86 chip with Intel or AMD. In any event the lack of rational updates tells me they are up to something that diverges from off the shelf parts. I have to disagree with this on many counts. The fact of the matter here is that the iPad and the Mac Book are very similar performance wise. The extra thermal head room ought to allow Apple to get even better performance out of its A series processors. At the moment no body really knows where the A series maxes out clock wise. The net take away here is that Apple already has hardware capable of installation in some of its Mac hardware. Second a Mac is a mac when it runs Mac OS. Besides Mac software has been native on 68000, Power PC and now i86, it can easily be native on ARM. The hardware underneath has very little to do with a Mac being a Mac. You are looking towards the past to try to divine what will happen with future hardware changes. While that has some purpose a better perspective would come form following Apple WWDC conferences. They have take considerable effort to get developers to follow a series of recommendations that would minimize the pain in supporting new hardware. Beyond that todays apps are either pretty CPU generic or are leveraging specialized hardware. Some of that specialization comes from GPU compute but the near future will also see a heavy reliance upon hardware to accelerate AI like calculations. The ""CPU"" architecture simply isn't a big deal anymore. Actually PPC was not a powerful chip when it came to integer performance. That is why we had Steve Jobs up on stage trumpeting the floating point performance of the PPC chips in use at the time. At the time that Apple switched to Intel, the average i86 chip would crush any PPC chip in the integer realm. Sadly it is these sorts of calculations that make a huge difference in the feel of an OS. PPC was barely half as fast as the Intel hardware of the day. There could be all sorts of reasons why it hasn't happened yet. It would likely take 3 years from the decision date to go with ARM to having a collection of suitable ARM chips for the Mac lineup. Considering the rumors have been stacking up for at least a couple of years now we could see something soon. In any event I keep coming back to the Mac Mini and have to ask myself why hasn't Apple updated it or replaced it. There have been several intel releases and frankly AMD release since the last revision that would make for a solid update of the platform, yet we have seen nothing. Then you have the rest of the desktop and laptop lines which have received nothing in the way of substantive updates. So what is the problem at Apple, Don't care?, Lazy? or Maybe hard at work on ARM based machines. I don't really know but sadly it has me buying hardware from places other than Apple for the first time in a long time. The value equation is just so bad these days with Apple hardware that I cna't justify the purchases. This especially when I have a $700 laptop running Linux that runs circles around my 2017 13" MBP laptop. That is with an AMD chip too. I just don't think people realize how bad Apples Mac hardware is in the wider competitive world. In a very literal sense it hasn't been this bad in decades, maybe never this bad. So Apple better have something up its sleeves to justify the current hardware state. Apple is going step by step. Software is key. See current step. In 10.14 developers got tools to much easier port iOS apps to macOS. Apple want to make macOS more familiar for hundreds of millions of iOS users. Big chunk are Windows users. Give them apps they are familiar with. So we can speculate Apple is heading to frontline attack on mainly notebook market. Maybe desktop one as well. But probably higher end. One of its step can be apps containing code for intel and arm. Or better when you install app you will download only appropriate binary. When you will have ported your app for 10.14 you have huge amount of work done. So dual binary apps can be part of 10.15 or 16. Just logical step. And now one my pure speculation as I have no knowledge here. Is it possible that any chip like T3-4 chip could help with code translation/emulation as it is helping with encryption? Then who cares about CPU architecture? You guys really don’t understand this. If Apple were to have an iOS laptop, then yes. It would just be an iPad with built-in keyboard. but not when running macOS. all Mac development hasn’t stopped. Seriously, think a little harder about what’s happening. Apple is going all out with AI. Intel’s chips are constantly delayed. Instead of coming out with updates, Apple waits for the wanted chips to appear. This delays development. There’s no evidence that all Mac development has ended. I know this is a popular theme, but it isn’t correct. What they’re doing with the Mini isn’t know. But that just one line. and stop using the word “rational”. I see a coup,e of guys are now usi g that word as though it has meaning here. It doesn’t. It just has meaning to you. You don’t know hat rational upgrade means to Apple. Ugh! Stop pretending that because you don’t know something, because y;use not thinking about it in the proper context, that it gives room to do something that it may not be able to do. clock speeds aren’t infinitely extendable. When Apple upped its clocks a few years ago, it was a shock. The designers they were using didn’t allow for such high clocks. Obviously, according to chip experts, they changed the design to allow it. But in doing that, they limited clock increases for the future. The designs they use are specifically made for low power. They can’t be extended much to, say 15, or higher wattage, without extensive redesign. If they do that, they change from what it is now, to something else. I’ve been saying that that’s what they would have to do. you gloss so easily over the concept of software on ARM, that obviously you haven’t given it any real thought. Advocates for macOS ARM machines seem to do this. It’s not a minor issue, it’s the entire issue. You ywant to dismiss it as though it doesn’t matter, but it does. We have no idea whether big software developers would want to do another very expensive changeover the way they did in the past. If you think they will, then you are making an assumption you have no right to make. the ppc was a powerful chip in integer performance. The problem was that in the end, Motorola stopped meaningful development, and it fell way behind. When x86 has twice the clockspeed, there was no way it could compete. But we’re talking competition at the top end. The A series, despite wishing and hoping, is nowhere near that level. It competes directly against Intel’s ultra low power mobile chip lines pretty well. But it doesn’t against their low power lines, and not even close when talking Desktop lines at far greater power levels. Its known that a chip emulating another chip needs to be 5 times faster to equal the performance. 5 times. That why the best that could be done with Virtual Pc was a 20% performance level, and that was before Intel rapidly increased clocks when they began the Netburst architecture. Before that, the performance was about 30% faster in integer, and almost 50% faster in float. That’s not including the special instruction set of Alti-vec. Rumors mean nothing. That there have been rumors for two years only reflects the wishes of those starting the rumors. we don’t know what Apple is thinking about the Mini. That’s been gone over in my above post already. You brought it up twice now. Here is making the case for new ARM-based Mac CPU's. macOS is derived from NeXTStep / OpenStep and was designed to be cross-platform from the beginning. How do you think they switched from PowerPC to Intel so fast? Because they had an internal Intel build of OS X since day one of OS X. It ran on IA-32, PA-RISC, and SPARC CPUs among others. iOS is a derivative of OS X. That funky .App/Contents/ bundle tech? Yeah, NeXT had it and you could compile for multiple processor architectures and it would include different binaries and share all the common Resources. So it is not a big stretch to imagine Apple could one day transition away from Intel. Apple bought P.A. Semi founded by one of the lead designers of the DEC Alpha and StrongARM CPUs. They proved their designs could be extremely power efficient. Apple now designs its own silicon. The T2 is based on the A10 CPU (ARMv8-A) for iOS devices. While the T1 (ARMv7) was closer to Watch hardware. The T2 can likely do a whole lot more than it does currently. Apple's current SoC (System on a Chip) designs are for mobile devices and as such are optimized for power efficiency across the board. The latest A11 CPU has 2 high-speed cores and 4 energy efficient multi-cores plus a few more cores dedicated to ML Machine Learning and handling the facial recognition of FaceID. Not to mention the Secure Enclave, Apple custom GPU, etc. It can compete with some Intel CPUs and in certain benchmarks, it is faster. There is absolutely no reason Apple cannot design a laptop CPU to compete with Intel. In 2015 they spent $8.1 Billion on R&D and much of that was for CPU design. It was ramped up to $10 Billion in 2017. Note, other companies like Microsoft spend a lot more but they typically light the money on fire with pie in the sky ideas that will never see the light of day. Apple doesn't do that, they are laser-focused on a target 5-10 years away and they never stop pushing toward that goal. Only a handful of people at Apple know what's going on with their CPU designs. The R&D and test labs are scattered throughout the valley and located in unmarked, nondescript buildings with extremely high-security measures. I don't know when it's going to happen but Apple will one day produce their own laptop/desktop CPU SoC line of high-end 64bit ARM-based RISC processors that will be heavily customized for Apple's unique needs. They will use a lot less power and will move to smaller nanoscales as that will mean even more efficiency leading to greater performance and more battery savings. The size of the system boards will continue to shrink. What if you could have a MacBook Pro with 128 CPU cores, superfast Optane like nonvolatile RAM/SSD, and still have all day battery life considerably better than what is available today with the MacBook Air? How would you like 18-24 hours of battery life? Intel's breakthrough with Optane means it's fast enough to be main system RAM yet behave like Flash but without the limitations of Flash such as slow writes unless it's erased first and a limited number of writes. Yes, it's out there now with Intel SSD Optane technology and Intel is going to be releasing Optane RAM soon. Suddenly, the need for super fast RAM and slow storage goes away. You merge storage and RAM and redesign the OS to handle it. Perhaps simply allocated a portion of the storage as RAM and the rest as storage. No need to hibernate nor sleep you just power off and back on with instant resume. Who has the resources to integrate that technology at the hardware and OS level? Apple, that's who. Watch, it will happen in the coming years. Supercomputers in your backpack will become a reality. Plenty of room for new and fascinating breakthroughs to come. Who knows what's going to happen but rest assured, Apple is playing a long game and is not aiming at today but shooting for stars in the distant future. Today you can get CPU's with 32 cores intended for servers. It's not a big leap to hit 5 nanoscale and super efficient SoC designs that can produce 128 cores and do it far better than Intel who is trapped in x86-64 CISC designs vs much more efficient ARM RISC designs. Who is to say Apple has to stick with ARM designs, they can literally break the mold and do something new. They optimized teh ARM designs stripping out everything but the kitchen sink to ditch legacy junk. Very nice, and you put some time into it, but none of that brings us closer to whether Apple will do this or not. we don’t need, and don’t want 128 cores in a Macbook Pro. What for? Those cores will use a lot of power no matter what, and will be sitting idle 99.9% of the time. about Optane. It’s not as fast as RAM. Maybe someday we’ll out there, it might be, but that day is well off. Right now, Optane is fast enough to be used as a secondary memory subsystem, but not for main RAM usage. Maybe you should read up on this before wildly going with the premise. nobody even knows yet if 5nm is doable. Intel even removed it from their roadmap. ARM, like x86, is a combination of CISC as well as RISC. Call me troll or whatever you like. I signed in just to tell my frustration with the T2 and Tx to come. My first "WTF moment" when I received a MBP 15" 2018 was, "where is the HDMI, where is the USB?!!". Apple is to be blamed for causing the disease of "slimmer! lighter! (but you need whole bunch of appendixes for connectivity) ". If they really talk to each other, the International Olympic Committee and Apple should punch each other in the face and bring to the court for failing each other's motto: "Faster, Higher, Stronger" vs "Slimmer, Lighter". 1. (iOS) many of my iOS apps can't run on the newer versions. The solution that my iPhone offered is "do you want to delete the app?". 2. I was cheering up "Oh Yes!!!" when I saw the HDMI made a comeback on the Macbook pro 2015. Then it disappeared again, just to cause the "apendix-itis" more serious. 3. Now the only four USB-C holes popped my eyes, and make the apendixitis came off the chart. 4. Last but not least, T2 does not allow me to install Linux. No matter how perfect MacOS/MBP is, it should not prevent a legitimate customer to do what they want with what they paid for. This is the last drop I can not take. The T2 isn't the problem for running Linux as a whole, but you're right, it can't be installed on the internal drive. Plus, there is no driver for Apple's SSD. Linux does run on the machine, though. Regarding HDMI -- the HDMI protocol is embedded in the USB-C standard. No dongles, no adapters. One USB-C to HDMI cable for $8 from Amazon will do the job. My first "WTF moment" when I received a MBP 15" 2018 was, "where is the HDMI, where is the USB?!!". Apple is to be blamed for causing the disease of "slimmer! lighter! (but you need whole bunch of appendixes for connectivity) ". My first "WTF moment" about your comment was the fact that you chose to receive an MBP without figuring out what the machine was and what ports it had.